I have for many years used a mobility scooter. A nice solid slow 4 wheeler limited to 4mph and designed for pavement use. My problem is that I use it on trains from time to time, and the different train operating companies have different rules, which mean that I can go to some places but not to others, even some where Dr.Beeching did not close the lines. An example of this is that Arriva Trains Wales will (and often do) carry my mobility scooter anywhere on their system. Great Western Trains (formerly First Great Western) refuse to carry my mobility scooter anywhere on any of their trains. This means that I can travel from Cardiff to Newport or Swansea but only by some of the trains and I need to know which company provides which train. The epitome of this madness is that the route from Cardiff to Southampton used to be part of the Welsh franchise, but was moved to the Great Western one by an administrative act. That meant the top bosses were different but the staff on the trains, the staff on the stations, and the actual trains were identical, but overnight I was no longer allowed to travel on that route. When I asked why, the answer was that they had "done a risk assessment" but a motor scooter such as mine was "too dangerous". If I got rid of it and bought a three wheeler version it would magically become safe again. 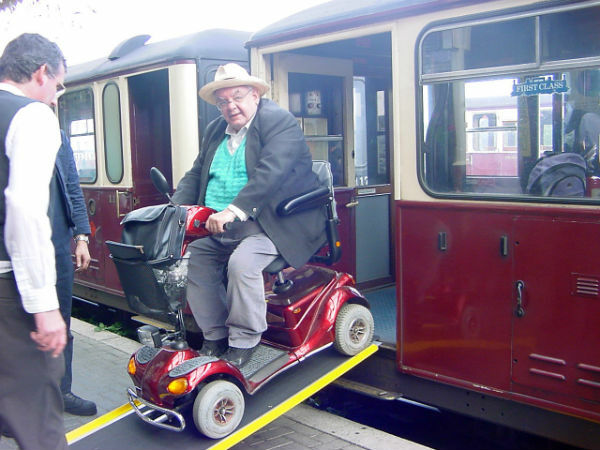 When I sought advice from a disabled organisation they asked me not to make a fuss abut it or there was a danger that the train companies would get together and agree a common code which would, inevitably, be the least service any of them offered, and nobody in the country would be allowed to use a mobility scooter on any train. I think I am a reasonable man and do not scream "discrimination" at some of the things I cannt do. However, on this topic, I have a photograph of me and my scooter being unloaded from the Ffestiniog Railway, one of the smallest railways in the country. My problems are over -Transport for Wales have now BANNED 4 wheel mobility scooters. Actually they haven't done EXACTLY that - they have just imposed a turning circle maximum which NO four wheel mobility scooter legal for sale now in the UK can meet. By four wheeler I mean one in each corner, not the effectively three wheeler with two front wheels very close togerther at the front, which are just as liable to tipping as any three wheeler. In London, the DLR has 'step free' access from platform to train, I find it bizarre that the "new" CrossRail (aka Elizabeth Line) trains require ramps. My mobility scooter is Overall Length 114.3 cm (45 in. ), Overall Width 56 cm (22 in.) which is well within the footprint of an invalid carriage as defined in the Equality Act 2010. You could take this issue far, as a Human Rights issue.